The Annual Spiddal Gathering us almost upon us and once more we anticipate the sweet sounds of the playing of tunes infiltrating the chilly winter Spiddal air and insinuating their way into the ears of unwary passers by, causing foot tapping, singing and even dancing to spontaneously break out at random. The Spiddal Gathering is currently in its seventh year and in honour of the occasion we at Spiddal Sessions interviewed Tom Giblin and Maria O'Hare in their historic and musically significant home, Lord Killanin's Gate Lodge, one time home to Dé Danann and the scene of many an impromptu session over the years. From the baptismal flooding of the first year to the ever increasing number of barrels of later festivals, Tom and Maria take us through some of the highlights of the yarns that have emerged from the Gathering over the years. We have included, for your entertainment and enlightenment, some photos of previous years and some clips of rare film footage of certain musicians, well known locally, playing in the Gate Lodge at various times. We hope to gather more information at the Gathering itself (20-22 November 2015) from willing participants and eventually to amass enough material to produce a major Hollywood movie, with George Clooney and Meryl Streep playing Tom and Maria for Spiddal Gathering: The Movie, or, failing that, to create an interesting archive for the wonderment of future generations. We hope you enjoy our first attempt at manipulating film for our purposes and we hope to bring you more of the same in the future. ...tentative because several encyclopedias could probably be filled with the thoughts musicians have expressed on this topic over the years, throughout the country and the world at large. However, in the spirit of helpfulness and encouragement towards those just starting to join in sessions, here are a few broad principles most people are agreed on. This is only intended as a light-hearted general guide to inserting yourself into sessions for the first time without feeling like an elephant in the room. It is most definitely NOT a “rule book” for sessions and the best way to get to know the figaries of a particular session is always going to be to visit it frequently. Note: this helpful narrative is aimed at those who already have a good store of tunes and feel ready to join in a session. Beginners or those who can play well but lack enough tunes to play in a session can check out the “resources for learners” section of our website http://www.spiddalsessions.org. 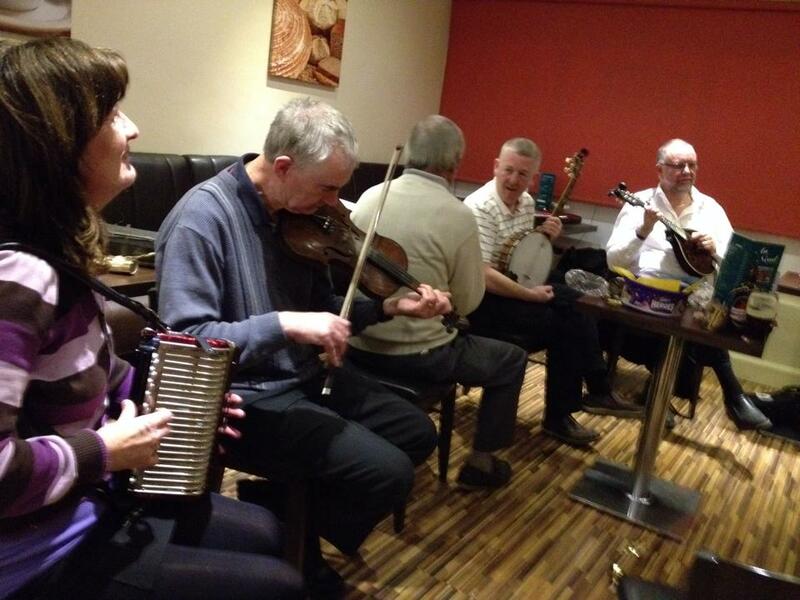 The best place to learn about playing in sessions is in the Seisiún Foghlaimeora! Always ask first – it's just polite! Even if the atmosphere is very friendly and welcoming, it is polite to ask before joining a session. It gives the musicians a chance to say hello and give you any information you might need, such as whether tonight they are exclusively playing 16th Century dance tunes or whether they are partial to playing in E♭ . Follow the leader – even in the most chaotic of sessions the discerning observer will notice there are one or two musicians directing the music and these are the ones to watch for cues for when the tune is changing or ending. Often they will ask someone to start a tune and then that person is leading the set and should be watched for subtle eye movements or the sudden shouting out of keys or names of tunes. Listen carefully – you might think you know a tune, but it might be a different tune or a different version than the one you learned. Also there are many regional variations to the way tunes are played; tunes can be played “single” or “double” (each part played once or twice) and some tunes have different parts or are played in different keys. Tunes will be played at different tempos and with different emphasis, sometimes twice, sometimes three times or even more if the tune is going well! Listening is always important, but never more so than when you are first becoming aquainted with a particular session and the local style of playing. If you don't know the tune, don't play it – at least at first. All sessions are different in the level of tolerance to people tootling and scraping along with tunes they half know or don't know at all. Obviously a learner session is the ideal place for this, as long as you are not knowing the same tune everyone else is learning. It's true that the session is the best place to pick up new tunes, but you need to be fairly confident of your abilty to pick up the tune fast! Keep an eye on the other musicians for cues about this, as well as all other matters, but don't assume that if there's one person sitting in the corner who doesn't appear to know the tunes but is merrily playing along anyway, that means it's OK for you to do the same. Spiddal Sessions hosts a learner session all year 'round at 8pm Fridays in the cafe through An Nead, Main Street, Spiddal. The session is open to all levels and is an informal weekly gathering of learners, facilitated by professional musicians. The “Seisiún Foghlaimeora An Spidéil” is an open group and the tunes and pace of learning are dictated by the learners themselves and this is an excellent place to get used to playing with others. Local musicians have been filmed lingering on the edges of the Roman Empire! 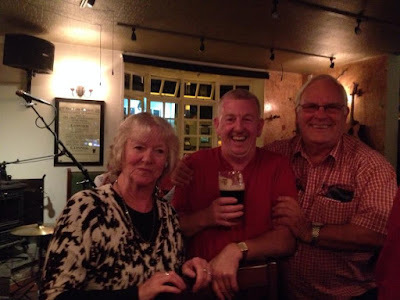 The musicians in question, Steve Sweeney, Meaití Jó Shéamuis, Nóra Geraghty and Sandra Johnson, known locally for playing tunes in Spiddal pubs and at musical events throughout the known universe, are now world-famous in the UK, where the documentary was aired. – the People's Front of Spiddal! The episode in question is the third in a series of three documentaries entitled: The Celts: Blood, Iron And Sacrifice, with Alice Roberts And Neil Oliver. The intrepid documentarians find themselves on the edge of the Roman Empire at the very end of the last documentary in the series, where they conclude that whatever the Romans may or may not have done for us, they didn’t, apparently, invade us. Instead they left us free to carry on the traditions and way of life of the Celtic peoples. They caught us on a fine day during the Annual Traid Phicnic in July and filmed us extensively as we engaged in our traditional ceremonial playing of tunes in the outdoors. They also caught Steve Sweeney down at the Sean Ceibh, speaking in his traditional language with others who also remained visibly unravaged, unmoved and unconcerned by the forces of Rome. Steve Sweeney: "We were all set to throw lit turf at the Romans when they came, but they were nice really. They just wanted to play a few tunes and they didn't try to conquer anybody." The appearance of Spiddal’s troubadors is brief, but nonetheless has already been spreading ripples which will lap the shores of all the lands where Celtic peoples congregate. 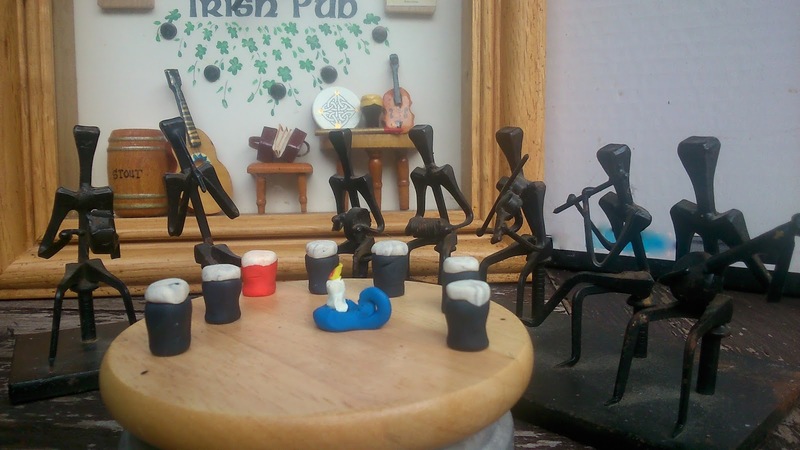 If any of you Celtic peoples out there would care to join us for a tune, we’d be delighted to welcome you to our spot perched precariously on the Altantic shelf. Too windy and wet for the Roman’s I’d say! One fine summer Sunday in mid July 2012, We caught the last bus from Galway to An Ceathrú Rúa. As the bus arrived in Spiddal, Brett Mooney, travelling with us, urged us to get off. We were most unwilling at first because our landlord was expecting us. After assurances from Brett that it would be of no concern to the landlord what time we arrived and we could share a taxi later, we reluctantly got off the bus. As we walked into An Tobar, as it was at the time, Brett was greeted heartily, as Gaeilge, by local men and the lovely blonde violinist. For the next three hours we enjoyed wonderful music and Guinness, and thought “Gosh isn't Spiddal fun?”. After the session we took a cab to An Ceathrú Rúa and spent the next fortnight at the language school. When the classes finished we were advised that Irish was spoken widely in Spiddal and there were four pubs, most of which had music. So we booked into the Ard Eoinin for a couple of days and stayed eight weeks. We went to Tigh Hughes Thursdays, Fridays and Saturdays. 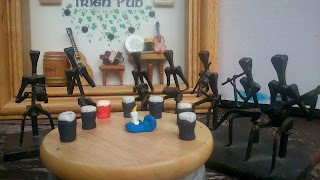 We wouldn't miss the Sunday Session at An Tobar, and sometimes, the Néad and the Crúiscín Lán gave us bonus music nights. Tigh Hughes closed and Tigh Giblin opened and nowadays there is music every night at Tigh Giblin and we are totally spoiled for choice. What a lovely way to spend the Australian winter and Irish summer. 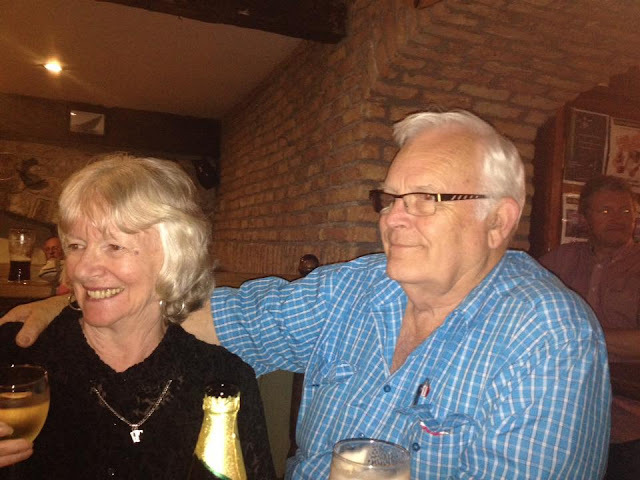 Frances and her partner, Ian, are Australian retirees who spend every summer in Spiddal learning Irish, playing bodhráns and generally becoming more Irish than the Irish. Ian has now taken up the feadóg and we are expecting great things from him when they return next year! Winter has arrived suddenly for the musicians and purveyors of culture in Spiddal and most of the summer sessions are suspended for the quiet months. The famous Sunday session is still going in An Droighneán Donn every Sunday at 5.30 and Ned Giblin leads an open session in Tigh Giblin on Monday nights from 9.30. The next big event we're all looking forward to is the 7th Annual Spiddal Gathering 20th-22nd November. One of the best yearly events in Spiddal, the Gathering sees musicians from all over Ireland, England, Scotland and further afield arrive for a solid weekend of tunes, good company and the finest of food and drink. There are no classes, workshops, concerts or competitions, the Spiddal Gathering is purely a musicians' festival; we gather just to swap tunes and stories and we fill Spiddal's bars with music all weekend and often well into the following week. Anyone looking for information or accomodation should have a look at the Facebook page at www.facebook.com/spiddal.gathering. More about this in future blogs! Now seems a good time to think about developing our blog and YouTube channel and we have several ideas which we hope to work on over the winter and bring you regular news on the blogspot as well as new tunes for learners and videos and links to other items which might be of interest to our friends. Meanwhile, we would like to extend an open invitation to fans of Spiddal Sessions to contribute items for inclusion in English or Irish. We are interested in everything from upcoming events to personal experiences and impressions of Spiddal and its musical tradition and historic anecdotes or photographs. Send contributions to spiddalsessions@gmail.com. Spiddal Sessions has been set up as a profit-free forum for aficionados of traditional music. It is run by volunteers and we promise never to sell your articles to the NSA, but still, it might be best not to put sensitive or libelous information in items for blogging. I am often asked, usually by people from abroad who take more of an interest than the locals in such things, what a session is and how it works. They cannot understand how a gathering of musicians can sit down and play together, switch keys and tunes, change speed and finish together – all without direction! Others can't count in blocks of 8 and 16, never get the structure of a tune sorted out and never know when it's likely to end. There are yet others who cannot differentiate between tunes. A great insight can be gleaned from a Cockney man's description of a session. As told by my good friend Pat Finn, the Cockney had been brought to a session in London by his Irish girlfriend and enjoyed the atmosphere very much. Commenting afterwards he said: “It was a great night, but one thing I could not understand. The musicians played the same tune all night and at the end everybody stood up and they played it all over again! Cor blimey!”. A session is usually comprised of the participating musicians, listeners and onlookers and a third group who neither listen nor look. The importance of good listeners positioned around the musicians cannot be overstated as they help to bring the best out of the musicians and make the session a success. A session by its nature is unrehearsed and spontaneous and it is not possible to say in advance whether it will be very good, fair or mediocre. There are also certain unwritten rules which everybody should respect. The fact that you are a musician, a bodhrán player or a bones beater doesn't give you the right to join an existing session. If the players want you to share in the session for whatever reason then they will invite you to join them. A session is usually controlled by one person, sometimes aided and abetted by one or two others. Between them they decide on the tunes, the repeats, when to start, when to stop and when to call for a song. With gentle movements, unnoticed by those outside the circle, the leader fashions and weaves the entertainment for the benefit and enjoyment of everyone around. A good session can leave you walking on air, send you home happy and keep your mind filled with music for a whole week. New tunes, old tunes, new settings, old settings, all are there to be enjoyed, captured and stored in the treasure box of the mind, to be recalled in a period of quiet reflection or at the next session.